Evolution of real-time GNSS reference networks and data processing has evolved to the point that NASA-backed researchers believe they can soon implement large-scale demonstration tests to provide earthquake and tsunami alerts to the general public and emergency responders. 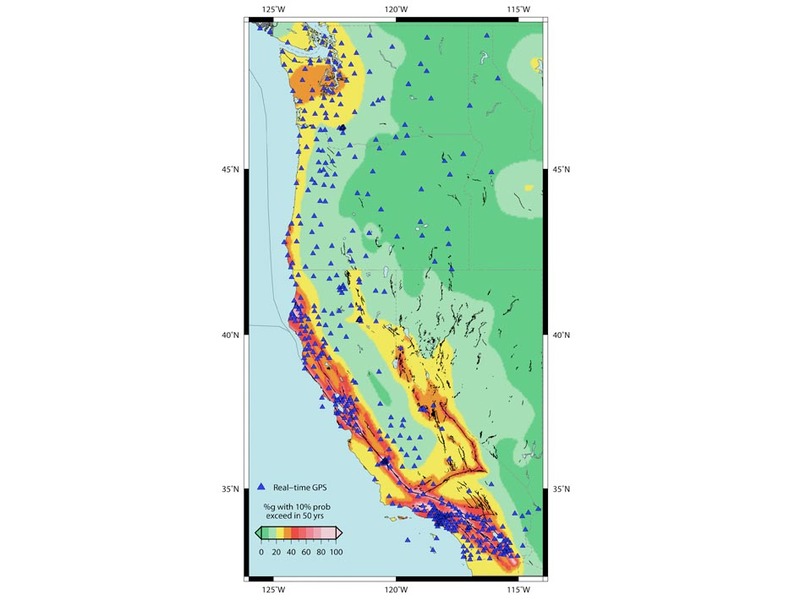 The Real-time Earthquake Analysis for Disaster (READI) Mitigation Network uses real-time GPS measurements from nearly 500 stations throughout California, Oregon, and Washington. When a large earthquake is detected, GPS data are used to automatically calculate its vital characteristics including location, magnitude and details about the fault rupture. Most of the reference networks currently use dual-frequency GPS receivers, precise point positioning (PPP) techniques, and a variety of high-precision orbit analysis software, according to Yehuda Bock, director of Scripps Institution of Oceanography’s Orbit and Permanent Array Center (SOPAC) in La Jolla, California. The new research network builds on technology development supported by the National Science Foundation, the Department of Defense, NASA, and the U.S. Geological Survey (USGS). The development has been decades in the making as geodesists — and their commercial colleagues in the land surveying community — were among the first users groups to employ the space-based technology, even before a complete satellite constellation had been put in place. They got into the field early — in the latest 1980s — because of their ability to time survey missions to correspond with the availability of sufficient GPS satellites to provide good positioning results. "By using GPS to measure ground deformation from large earthquakes, we can reduce the time needed to locate and characterize the damage from large seismic events to several minutes,” Bock said. Earthquakes generate two main seismic waves, a primary or P-wave that typically is detectable only with sensitive monitoring equipment, and the secondary (S-wave) that displaces the ground perpendicular to the direction of propagation — that is, the destructive shaking element. Seismometers only measure the strength of Earth motion from earthquakes while GNSS technology can measure the actual three-dimensional displacement of the Earth’s crust that has occurred. Another advantage is that strong ground motion can actually “clip” the signal of seismic equipment, that is, go off the scale, while GNSS measurements continue to measure movement during even magnitude 8 or 9 events on the logarithmic scales used to measure the strength of earthquakes. Because of these characteristics, Bock told Inside GNSS, the networked GPS data cam characterize the magnitude of an earthquake as quickly as 2 minutes compared with a typical time of 20 minutes for seismic networks to generate the same results. The READI Mitigation Network will be able to predict when an S-wave will arrive, where the shaking will occur, and how intense it will be. That information can give public safety organizations a head start on deploying assets to the areas of greatest need, and conceivably even alert citizens at greater distances from the epicenter about the arrival of an imminent event. “Depending on the distance from the source [of the GPS earthquake data], you might have a minute or two when you can do early warnings, Bock said. Although GPS continuously operating reference stations (CORS) have been built out over the past 25 years, Bock says the new aspect of the effort stems from the ability to gather and process the raw data available on public servers — typically in RTCM or RINEX formats — and convert the data into geodetic displacements in real-time. The READI participants then use the displacement calculations to measure and model the earthquake events and rapidly distribute the information for public safety purposes. “It’s at a point now that we have all the pieces to put a system together,” said Bock, who has long been involved with GPS-based geophysical monitoring networks. In the early 1990s he oversaw development of the Southern California Integrated GPS Network (SCIGN) and its forerunner, the Southern California Precision GPS Geodetic Array (PGGA). Differences remain among READI participants about the exact instrumentation and data processing methodology that produces the best results. For instance, Melbourne believes that the GPS-only system established by PANGA can provide sufficient data on which to model an earthquake in real-time. In contrast, SOPAC is integrating GNSS and seismic sensors — low-cost MEMS accelerometers — into its network stations, blending the data “on the fly” using a Kalman filter. “In order to get a robust solution — without false alarming all the time — you can’t do it with GPS-only or seismic-only,” Bock told Inside GNSS. Although the majority of the network sites — about 80 percent — use only GPS receivers, Bock said that is changing. SOPAC recently acquired Topcon NetG3-A receivers and Topcon CR-G3 antennas with GLONASS as well as GPS capabilities and is incorporating the Russian GNSS system’s signals into its database. “It’s mostly GPS now, but migrating toward GNSS capabilities,” he said. A demonstration test of the prototype system will take place this year in the San Diego County area during the July/August time frame, according to Bock, and discussions are underway with other READI network participants about a much wider regional effort soon afterwards. These include the EarthScope Plate Boundary Observatory, the Bay Area Regional Deformation Array, and the California Real-Time Network as well as SOPAC and PANGA. The demonstration tests will use recorded data from previous earthquakes and communication links with emergency response organizations to simulate an event and distribute information. This approach is similar to that used by “The Great ShakeOut,” an earthquake drill that began in Southern California in 2008 and has since spread to other states and other countries. Each drill is coordinated by regional organizations, which work together by sharing resources and best practices. The 2008 drill marked an effort by scientists and emergency managers to inform the public about earthquake preparedness. It was based on the ShakeOut Scenario, a comprehensive description of a magnitude 7.8 earthquake on the San Andreas fault in southern California and the destruction it would cause. The U.S. Geological Survey (USGS) Multi-Hazards Demonstration Project, led by Lucy Jones, designed the scenario. The USGS led a multi-disciplinary team of more than 300 experts from academia and industry, public and private sectors to develop the ShakeOut Scenario and communicate it to end users including emergency managers and the general public. At the time, the Great Southern California ShakeOut was the largest earthquake drill in U.S. history, with a total of 5.4 million participants from eight counties practicing “Drop, Cover, and Hold On” exercises and other aspects of family, school, and workplace emergency plans. This year more than 2.4 million people across nine states participated in the 2012 Great Central U.S. ShakeOut! on February 7. Another 3,000,000-plus in six western states, British Columbia, Guam, and Puerto Rico will take part in an even more farflung “shakeout” scheduled for October 18. NASA, the National Science Foundation (NSF), USGS, and other federal, state, and local partners support the GPS stations in the network. “The relatively small investments in GPS-based natural hazards systems have revolutionized the way we view the Earth and allowed us to develop this prototype system with great potential benefits for the infrastructure and population in earthquake-prone states in the western United States,” said Frank Webb, JPL’s Earth Science Advanced Mission Concepts program manager.